These projects were made using my Tea Light Village files available here. Take a look at these and then try your own! The cutting files for these projects are available here in svg, pdf and dxf formats. And there are links to assembly tutorials for every file here. Reverse (mirror) the image so that I can print on the back of card stock and still have the door openings etc positioned on the correct side of the building. When cutting, I use a steel ruler for the roof edges, so they stay nice and straight and level - but scissors would work equally well if you cut carefully. For shorter edges, windows, flaps, rotunda etc I do those freehand with a scalpel. If you use a ruler for those, it’s too easy to overshoot on the windows and accidentally cut the “bar” that separates it from its neighbour. No-one will notice if one of the window panes isn’t exactly square, but they will if the hole is twice as big! For the trees, clock face, round church window I did invest in a swivel cutting blade as it makes it easier to do the curved edges. I used a straight blade before I had that and found lots of tiny cuts were best, as too much pressure on the blade to bend it round a curve can cause the blade tip to snap off. Personally, I think anyone attempting to do this by hand would be coming into it with some experience behind them (and equipment) and be aware of safety measures to take - so I don’t think that need be of concern to you. When assembling, I score along the fold lines first, to make it easier to form edges that are nice and crisp. Miles Dudley sent me this photo showing a beautiful combination of the Moose in Fir Trees and Covered Bridge files. He increased the size of the covered bridge to work with this gorgeous Christmas Eve table setting. Judi Klock Russo of Illinois has been making the buildings each year as they were introduced. She was thrilled to get the hex bases for LEDs because turning the tea lights on and off became a hassle as the village grew. ChiWei blogged about making her tea light village here. She added silver trees and pine cones to her display. Kate Himmelsbach completed this mantel display using the Tea Light Village for the 2017 holiday. She shared it on the Silhouette Cameo FUN Project Facebook group. Sam Madonia created a haunted version of Tea Light Village for Halloween. 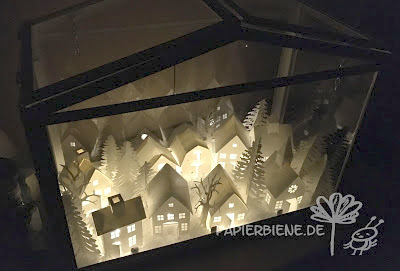 Bilde Müller of My Creative Hide Out Blog just posted photos of her Tea Light Village using colored LED lights. They slowly change. And this is the first phot0 I have seen using the new (2107) hex boxes for wiring. There are a lot more photos on her blog. Mary Cox made this beautiful 2017 village with the hex bases for her mom. Here is a tiered display by Helen Rose from the UK with added snow and icicles. Mary Groom of Western Australia made her tea light village and spent time making many trees in a variety of sizes. She added the picket fences in a unique way by wrapping them around the bases. She also noted that she used 3-4 coats of hair lacquer on a few of the more detailed areas (gazebo and rose arbor) to add more stiffness. Dianne Millgramm from Germany posted a couple of different display approaches on her website here. Deb Goff recently shared her Tea Light Village in the Cricut Design Space Facebook group. She used color-changing tea lights and this is what she noted about them: "The tea lights I used were purchased from Amazon and they are color changing so it is a lot of fun to watch the village change colors in a very slow non blinking kind of way! It is very peaceful and serene," and she provided a link to the tea lights here. Gail Kretchman writes, "My daughter, grandson and I made a fun project out of your Christmas Village. " Many have been writing in that this projects works with kids. Nice job Gail, Cathi and Nicholas! Marieke Lazarus from Austria shared her Advent Calendar made from the Tea Light Village files. She made a stunning display in black with multicolored windows. She displays it on her white piano. Stephanie Scharsig made this version Tea Light Village recently to give to her grandmother on her 80th birthday. Shani at Scrapbooks by Design made a Tea Light Village using textured card stock. Maryann Jenkins of the blog IRock Paper and Scissors added snow to the roof in her Tea Light Village. She blogged about it here. Margaret Cairns of The UK has taken an entirely different and creative approach to Tea Light Village. As the designer I saw them as simple with reduce detailed. She instead saw them as a canvas for much more. She hs created quite a fairy village with the same files. Edith Baerten from Belgium has added battery operated string lights and some covering snow to a display of Tea Light Village houses. Notice the wonderful addition of sliced logs as bases. And from Kate's Paper Creations is a display on a mirrored surface. Beautiful! Pam at Get Silvered did this display under a glass dome.